1.-) + 200 Page PDF Book. 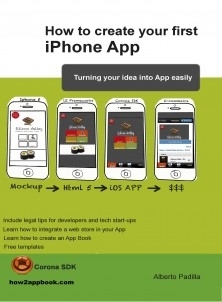 Everything needed to learn how to design your own iOS applications and Html5 WebApps. 2.-) 4 Case Studies. Design case studies to help you apply what you learned are included with the book. Learn how to design easily your virtual store integrating the paypal payment gateway to ease selling to your customers. Finally I give Legal tips which every app developer or enterpreneur must take into accountwhen developing mobile apps and setting up a start-up, you can download 100% free a iOS application development agreement and Start-up partnership_agreement.